So, I'll take a flyer at guessing where you're going with this, Karen. Classification slots materials into one place and one place only, on the sole basis of "aboutness." Are we perhaps moving into a world of explicitly-drawn and implicitly-gathered relationship metadata, where "where something belongs" depends on the criteria by which one is browsing? And where "aboutness" is just one criterion among many possible criteria? Yes, classification is about "aboutness" - but aboutness isn't absolute, it's contextual. Aboutness for a biologist is different to aboutness for a second-grader interested in dinosaurs. So one possibility is that we have an unlimited number of aboutnesses to fit the unlimited number of contexts. How that gets managed from the user's point of view is unclear to me, but the idea that there is one and only one organization of resources is obviously a non-starter (although it's a common approach). The other thing is that we shouldn't be limited to "about." When Amazon says: you might also like... that's not "about," it's another relationship, not even tightly defined, but still useful. I see linked data as being able to support those other relationships that may be built up over time using data that is gathered (and some old-fashioned social activity). As a user you should be able to follow topical paths but also use the "other" relationships that exist. These latter may be more serendipitous, and may be most useful when you don't really know what you are looking for or where you want to go from here. Believe me, this is not an area where I have answers -- it's what I want to explore because what we have today just doesn't seem right to me. because we see these phrases being used less frequently in google books, the library profession is no longer interested in the concepts behind the phrases. 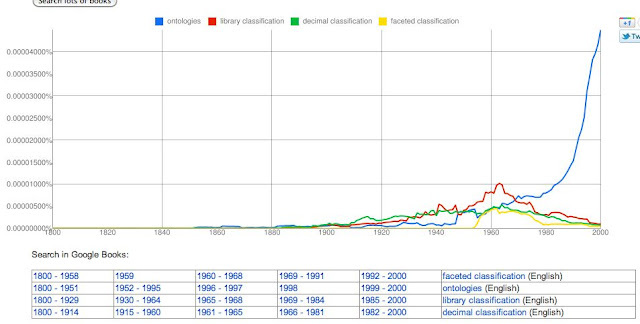 It seems like there is another explanation, that we are still interested in the concepts, but that we are now using different terminology to discuss it (at least in printed works accounted for by the ngram database). 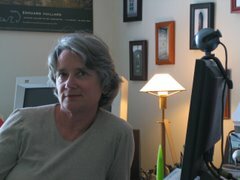 For example, look at the rise of "ontologies," "taxonomies," and other related terms (http://goo.gl/gli9q). Granted, not all of these are about library materials (some are, in fact, about dinosaurs - I'll also grant that these may be broader terms than the ones you've used). Are they not classification systems under a different name (and things that many library professionals are very interested in)? I agree with your statement that we might have just changed terminology, which is why I added "knowledge organization" to the mix, and wonder exactly what that means. I do think that some of the semantic web work is heading in the direction of "organized information." However, I still see a large gap in the library profession in this area. There isn't an ontology movement taking place. I don't see anything happening in the area of topical access that is even remotely near the energy that we put into resource description. There aren't active discussions exploring new ideas in topical organization. FRBR and RDA totally ignore this area, and FRSAD seems to be a structure for linking subject headings to descriptive cataloging, not for building an ontology. I am looking forward to the addition of LC's classification to the list of LC authorities in RDF. Although LCSH was the first vocabulary described in RDF it has little useful structure. I am hoping that sections of LCC will provide interesting playgrounds for linked data. There aren't any really rigorous classification systems in RDF that can compare to it. Just the day before reading this, I discovered that "subject headings" seems to follow a similar pattern: http://tinyurl.com/3lmulcq -- except that it peaks in the early 1970s. Wikipedia is a lot more comprehensive, both in the size of its concept space and the relationships between them (I've posted previously about Wikipedia as a concept-oriented catalog.) But the relationships aren't so easy to take in and categorize at a glance; and there's not as much connection as there could be between WP and library materials. JMO - great posts on concept-oriented catalog. I did have a moment of wondering if Wikipedia couldn't be our catalog interface... but connecting catalogs and WP seems entirely logical. I think I'll push some of this out to ngc4lib to see what it stirs up. Karen: I'm glad you started this conversation--it follows on with concerns I've had for a long time. I actually think LCC (and potentially Dewey, if so much of it weren't behind paywalls) could be really useful in this regard. LC has been doing interesting stuff with the newer classes (in law, mostly), which knocked my socks off when I first saw them (the document here http://www.aallnet.org/sis/tssis/annualmeeting/2009/handouts/indigenous2009-goldberg-handout.pdfdescribes some of what they're doing). In terms of links and context, it's much more useful than LCSH, in my opinion. Particularly if we can get past the 'mark-it-and-park-it' habits in our collective book-past, I think we might find some really useful possibilities. Diane, great stuff in that PDF about linking to LCC based on maps. BTW, I would really like to see more experimentation with FAST, but that, too, seems to have licensing issues. The non-topical facets of LCSH seem to have great potential for linking to a lot of other thesauri because they use the common concepts of time, place, and genre. In re terminology in current use, I wonder if people are now using the term "controlled vocabulary" more, which encompasses both library classification as well as subject vocabularies such as LCSH. Also, isn't keyword searching replacing other types of search because it is usually the default (or only) option for searching? I'm not remembering if any research has been done on this, but in my personal experience, users search using whatever is default. Following up on Diane, when someone (vendor?) figures out how to use DDC & LCC information in truly creative ways, I think we'll see more discussion & use. It will come, I hope. Of course, I've already been waiting about 20 years or so, but I haven't given up yet.